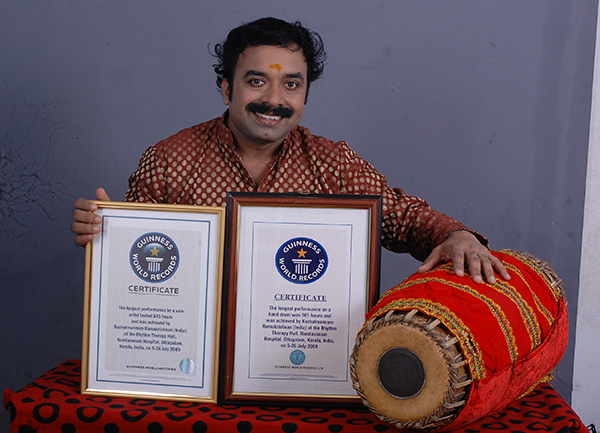 Dr. Kuzhalmannam Ramakrishnan has been bestowed with Guinness World Record Certificate five times for his performances of marathon Mridangam for the longest durations in the world. He is the first person in the world to perform more than 500 hours in Solo Concert, and still carrying world records in two categories (Guinness World Record Holder - Hand drum marathon & Longest Solo Concert of 501 hours). Commentation by a famous media: “11 musical records that are truly impressive. 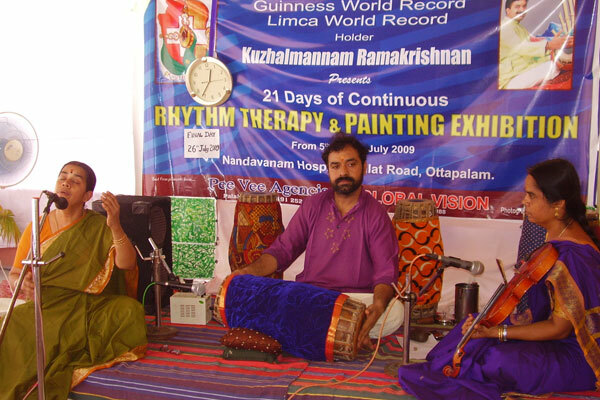 “Longest Solo Artist Performance” Indian player Dr. Kuzhalmannam Ramakrishnan managed an astounding 501 hours of play in Kerala in his home country, between July 05 and 26 2009” . Guinness World Record for the longest solo performance of 301 Hours.. The event held in Nehru College, Coimbatore, Tamilnadu. 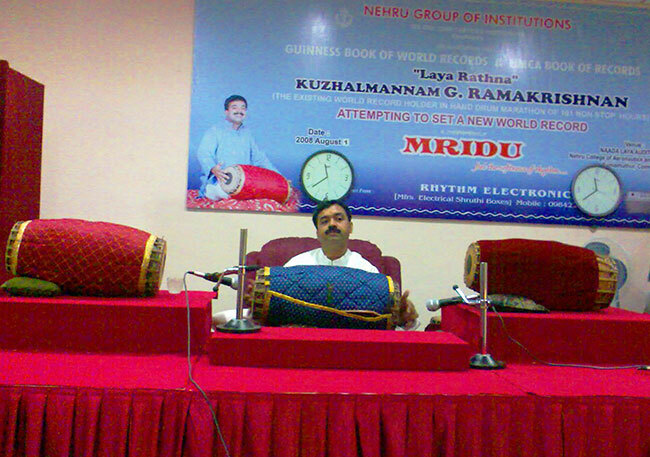 The event also did popularize the instrument Mridangam among the youth, while setting the Guinness world Record. 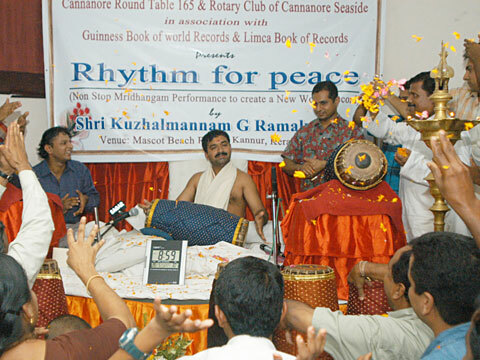 Guinness World Record for the longest solo performance of 101 Hours.. organized by Cannanore Round Table and Rotary Club of Seaside- ‘Rhythm for Peace’ aimed at disseminating the message of anti-violence and peace when the district was turbulent with political riots. 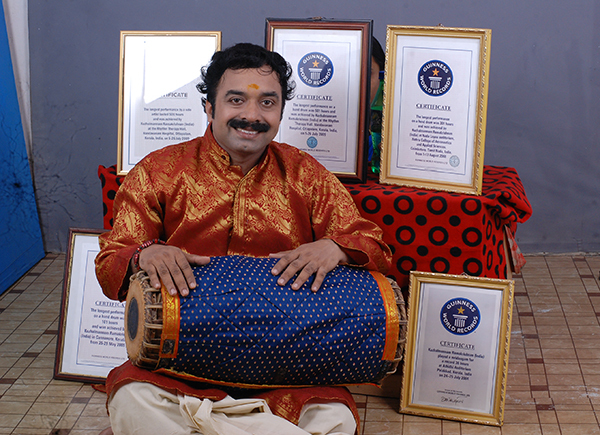 By this performance,he broke the world record of 84 hour continuous performance in percussion instruments set by Suresh Jaochin Arulanantham of Australia. 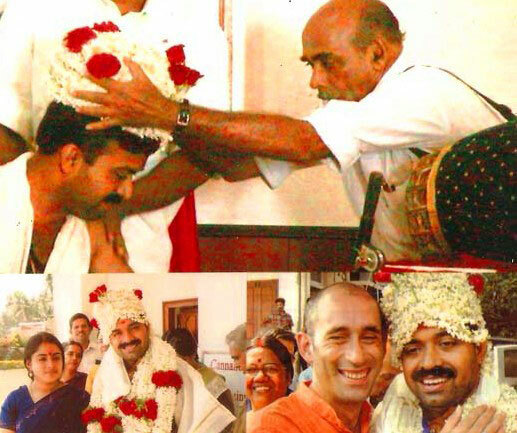 Conducted 36 hours of continuous Mridangam play accompanied by 130 carnatic vocal singers dedicated to all Cancer patients and in memory of his sister, who passed away due to Cancer in 2004. 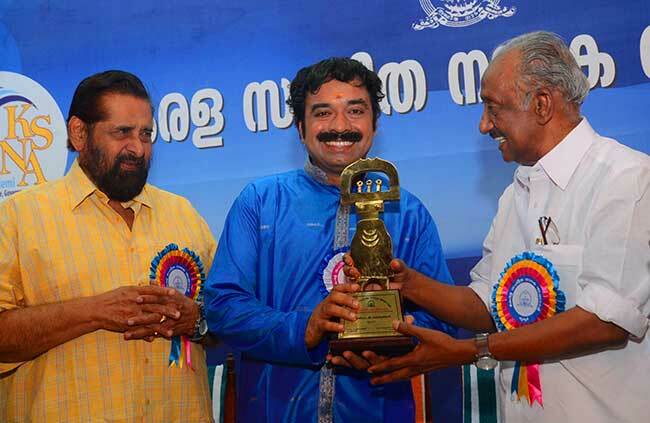 The event was organized by Swaralaya, Palakkad and created world record by surpass the 30 hours performance of Sri. Yella Venkiteswara Rao. His name entered in the Guinness Book of World Records and Limca Book of Records. Guinness World Record certificate presentation - Felicitation by hon.Minister A K Antony. Guinness World Record certificate presentation - certificate presented by Hon.Minister Vayalar Ravi. 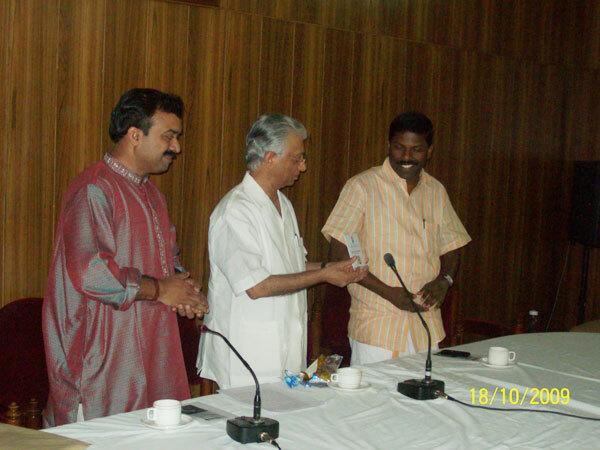 Ailment CD 'Relax with Rhythm' released by TKA Nair, Principal Secretary of PM to PK Biju MP, at Kerala House. Receiving the Guinness World Record Certificate from Hon. Minister for General Education, M.A. Baby. The Glorious event! - When old world record of 84 Hours was crossed. With 501 hours guinness certificates. 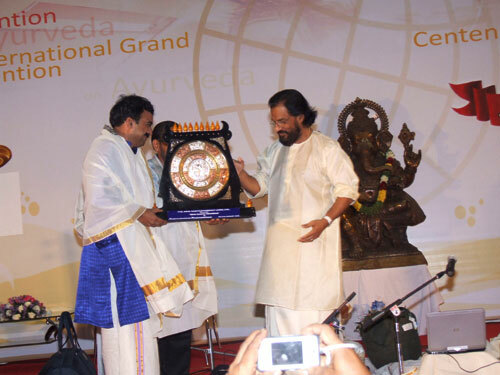 Kerala sangeetha nataka akademi award ceremony. Happiness at the end of event. Starting of guinness fete at coimbatore.